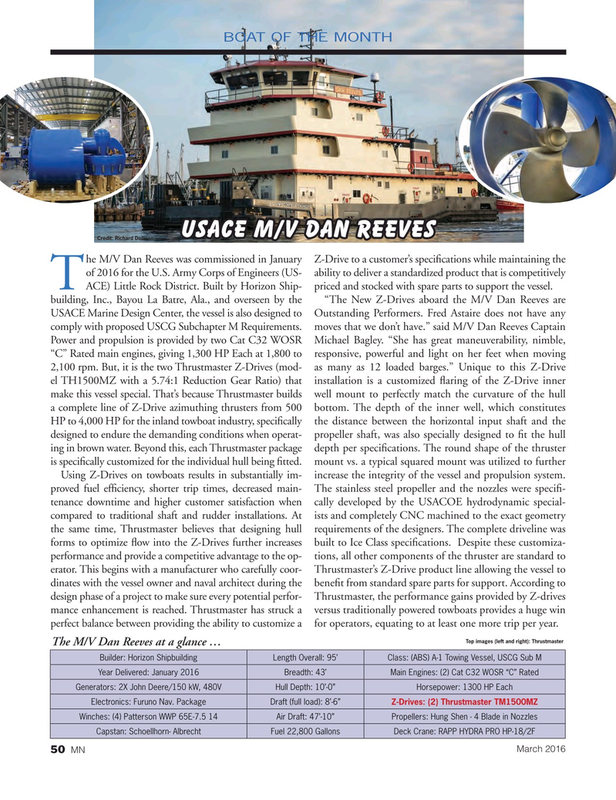 Using Z-Drives on towboats results in substantially im- increase the integrity of the vessel and propulsion system. proved fuel ef? ciency, shorter trip times, decreased main- The stainless steel propeller and the nozzles were speci? - tenance downtime and higher customer satisfaction when cally developed by the USACOE hydrodynamic special- compared to traditional shaft and rudder installations. At ists and completely CNC machined to the exact geometry the same time, Thrustmaster believes that designing hull requirements of the designers. The complete driveline was forms to optimize ? ow into the Z-Drives further increases built to Ice Class speci? cations. Despite these customiza- performance and provide a competitive advantage to the op- tions, all other components of the thruster are standard to erator. This begins with a manufacturer who carefully coor- Thrustmaster’s Z-Drive product line allowing the vessel to dinates with the vessel owner and naval architect during the bene? t from standard spare parts for support. According to design phase of a project to make sure every potential perfor- Thrustmaster, the performance gains provided by Z-drives mance enhancement is reached. Thrustmaster has struck a versus traditionally powered towboats provides a huge win perfect balance between providing the ability to customize a for operators, equating to at least one more trip per year.